Originally posted on LinkedIn Blog. Traditionally, neuroscience has been studied as a branch of biology focused on the mechanical aspects of the brain and nervous system. However, in the last decade, many innovative thinkers have begun linking the study of neuroscience with that of leadership development, performance improvement, innovative thinking, change management, risk management, education, consulting, and coaching. An organization is formed by a group of human beings who come together to serve a common purpose. When an organization goes through change, the people across the organization are impacted in one way or the other, requiring information, incentives, and re-adjustment. Similarly, when a human brain experiences change, the neurons across the brain networks are disturbed, requiring attention, motivation, and re-learning. Changing people can’t be handled the same way an organization would handle a process-change or a technology-change. Our brains are wired uniquely to perceive and respond to change, whether it is in our personal life, interpersonal relationships, or larger social environment. Our biological system, especially the human brain and its consciousness, operates uniquely based on every individual’s varying capacity of intellectual and emotional intelligence. Each individual responds (or often reacts) to change differently. Let us use an example. Sheila and Shelly are two co-workers responsible to drive international sales targets selling a phone-app product. Both have a set way of managing their sales targets using specific behavioral tactics, processes, and supportive toolsets.Due to a recent acquisition, they are now being asked to change their role from selling phone apps to selling new cloud technology product. This change impacts who they work with, who they sell to, how they sell, the compensation structure etc. Sheila might have a different change journey compared to Shelly’s. Sheila might already be aware of the change taking place but may not be interested in supporting or promoting it as she may not understand how this change benefits her. Sheila’s resistance may create a ripple effect among many others holding a similar view. In this case, a single meeting or a general announcement may not be sufficient for Sheila to come on board. A change manager may need to personally coach and find ways to minimize collective resistance and related risk factors. On the other hand, Shelly may act very supportive throughout the change project journey. She may attend all the meetings and visibly support the change by being a good spokesperson. But she may find it difficult to adopt to new processes or using new tools being introduced. For this, a change manager may need to introduce a more effective learning journey map and/or training strategies. What really goes on in the brain when resistance to change occurs? Every brain contains approximately 100 billion cells called neurons. Neurons connect with one another to form complex communication networks that, among other things, enable us to walk, talk, and breath without thinking about it. There are a staggering 100 trillion neuron connections in the brain. As anyone who uses a comparatively simple desktop computer can testify, it seems a miracle that such a complex system could work without crashing. Yet the brain smoothly, day in and day out, enables us to perceive objects in color, distinguish the year and place of a wine by taste, and (sometimes) understand calculus. Our brains are grid-like patterns. Patterns change based on the emotional activities, agility of memory formation process, power to contextualize and perceive complex situations. When change occurs at work, there is much anticipation of unknown factors. This can create stress. Unattended prolonged stress levels generate floods of damaging hormones such as cortisol. Stress reduces the dopamine level impacting motivation. Stress causes pre-frontal cortex to slow down its power of clear thinking, strategizing agile alternatives, etc. Lack of dopamine reduces the PFC capacity to think agile. Unable to self-regulate, the executive brain fuel goes low and doesn’t communicate as effectively with the limbic system. Thus, the limbic system responds with insecure emotions and continues to react with threat emotions such as worry, anxiety, fear. When people are personally stressed, their ability to attend to another’s needs are reduced. Feelings of social seclusion and social reject can hurt the group dynamics and team moral. Dr. Dan Siegel’s interpersonal biological explanation on how brain processes change shows a unique relationship between brain and mind. The relationship is the exchange (sharing) of energy and information flow. Chaos occurs in the brain’s neural network when there is an increase in the exchange of energy and information. This creates mental chaos and impacts behavior. Changing habits is hard at an individual level. Changing team or group mindsets takes much more planning, persistence, and reinforcement. Following are few helpful tips from my experience. Repeat, Repeat, Repeat to make it easy on the over-crowded cognitive memory. Communicate the same information at least 5-7 times. Working memory, a core executive function, is a cognitive memory buffer with a limited capacity that is responsible for the transient holding, processing, and manipulation of information. Working memory is an important process for reasoning and the guidance of decision making and behavior. Communicating (repeating) the same information approximately five to seven times forms stronger memory impressions in the brain. Repetition of new information helps formulate, contemplate, and innovate new information. But if you communicate complex new information only once in a single meeting or send out an announcement while expecting employees to reason it out effectively, you will be disappointed. 2. Mimic the desired behavior explicitly. Engage mirror-neurons. Human beings, just like others in the animal kingdom, imitate one another (we are usually just a little subtler). Mirror neurons fire when we act and when we simply observe the same behavior in others, mirroring the behavior of the other as though we were the ones acting. In his book, Neuroscience and Human Relationships, Louis Cozolino, Ph.D., explains that the mirror neurons lie at the crossroads of processing inner and outer experience where multiple networks of visual, motor, and emotional processing converge. These cells bridge information and action and influence group behavior. Cozolino notes that mirror neurons bridge the gap between sender and receiver, enhancing emotional resonance, empathic attunement, and mutual understanding. Visually stimulating communication plays an important role here. These cells (mirror neurons) bridge information and action and influence group behavior. They not only link the network within us, they link us with each other. Hence, they appear to be an essential component of the social brain and an important mechanism of communication among one another. Communicating to influence people’s behavior can be viewed from the perspective of a sender and receiver. What a sender says and what a receiver hears can be two different messages. Certain changes cannot be taught or explained; demonstration, interaction, and experience delivers them much more affectively. Our body language, tone of our voice, quality of attention and emotional state can add immense value as non-verbal communication components. A lot more can be accomplished with the non-verbal communications. 3. Make the change stick using the law of Neuroplasticity to your advantage. The most effective way to make and sustain a behavioral change is by successfully repeating the desired experiences. When we go to the gym and do a new exercise that puts tension on underdeveloped muscles it takes more energy and feels a bit harder. We may not like it at first. But with practice it becomes easier. The same goes with “resistance to change” — thinking about new ideas takes more effort. We need to process how we feel about the changes before that becomes second nature. Regulating human emotions also plays an important role in forming stronger neural pathways. 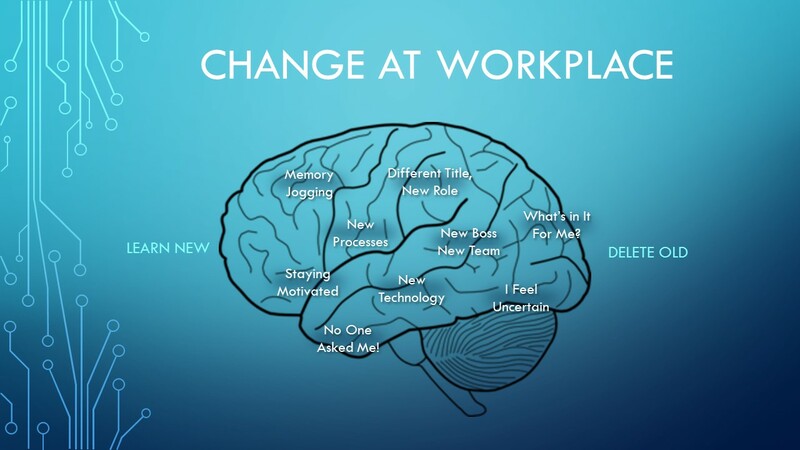 Change leaders and trainers can use the science of neuroplasticity to influence people to change and then sustain their momentum by providing the right emotional environment. Delivering a meaningful experience rather than just information is a key to effective training. The longer that existing rules or habits have been in place, the harder it is to generate changes in those neural pathways and the more often an experience must be repeated in order for the change to become a lasting behavior or mindset. 4. Show empathy to generate goodwill. Ease it for the brain’s learning and memory neurocircuitry. Empathy is more than simple sympathy. It is the ability to understand and support others with compassion or sensitivity. Simply put, empathy is the ability to step into someone else’s shoes, be aware of their feelings, and understand their needs. Social neuroscientist Jean Decety’s research suggests that shared neural circuits, self-awareness, mental flexibility, and emotional regulation constitute the basic macro components of empathy, engaging aspects of the PFC, insula, limbic system, and fronto-parietal networks. His study concludes that there is a positive correlation between an individual’s ability to experience and relate to the thoughts, emotions, or experience of others. I strongly recommend reading his book, The Social Neuroscience of Empathy. In the workplace, empathy can show a deep respect for co-workers and show that you care, as opposed to just going by rules and regulations. Granted, empathy is a loaded term with various definitions roaming the literature. But if a change leader possesses the capacity to be empathetic towards all those affected by change. He or she can create a vast positive and nurturing change environment. Showing compassion more explicitly helps boost employee morale and favors friendliness and cooperative social environment. Science proves this to be so. 5. Break the biased mindset. Activate neural networks that regulates perception and decisions within the executive brain. Human beings are notoriously poor and unskilled at controlling our own biases. We have natural neural tendencies in our brain to seek reward and avoid pain. But often, these instinctive tendencies contribute to a strong biased behavior. Social Neuroscience expert Dr. Mathew Liberman’s research suggests evidence that specific regions in brain are involved and show greater activation when people are behaving in biased vs. less biased manner. Less biased behavior activates ventrolateral prefrontal cortex region of the brain, responsible to regulate emotions and decisions that minimizes the impact of threat or experience immediate reward. Through his fMRI based research, he noticed that when an individual is more mindful, they can put mental brakes on to mitigate the auto-pilot mode of being biased. The unconscious drivers and biased behaviors that influence our judgement and decision-making are pervasive in organizations. It helps when a change leader can identify and mitigate biased mindsets early on, as an essential risk mitigation strategy. Mitigating biased behaviors requires a systematic approach. I personally like the effectiveness of COST Model of Managing Bias, published by the NeuroLeadership Institute. This model proposes strategies to mitigate biases related to corner cutting behaviors, objectivism, self-protection, time, and money. 6. Practice Mindfulness. It neutralizes stress-hormones and promotes resilient neural networks in the brain. Numerous fMRI-based science experiments have proven MBSR (Mindfulness-Based-Stress-Reduction) practice helps the human brain come out of the auto-pilot thinking mode, change a negative emotional pattern into a neutral present moment awareness further enabling a positive emotional state of mind. When we allow self-awareness to enhance focus within the present moment, the mind rings into a place beneath the auto-pilot mode that allows for new change to take place. Last year I blogged about five awesome videos on mindfulness and how the practice helps our neurons in the brain. Increasingly, big companies are investing in Mindfulness programs and providing courses and opportunities for employees to find their center. Many high-tech companies such as Google, LinkedIn, Microsoft, Nike are at the forefront and setting good examples. Corporate Mindfulness Programs are becoming one of the most cost-effective workforce effectiveness and team building programs. Here’s a good panel discussion that recently took place in San Francisco amongst the business elites on how Mindfulness at Work supports and disrupts intended change.